Vocare - the NHS 111 and Urgent Care provider perceives Quinyx as the ideal SaaS solution (software as a service) for the Urgent Care sector in the UK. 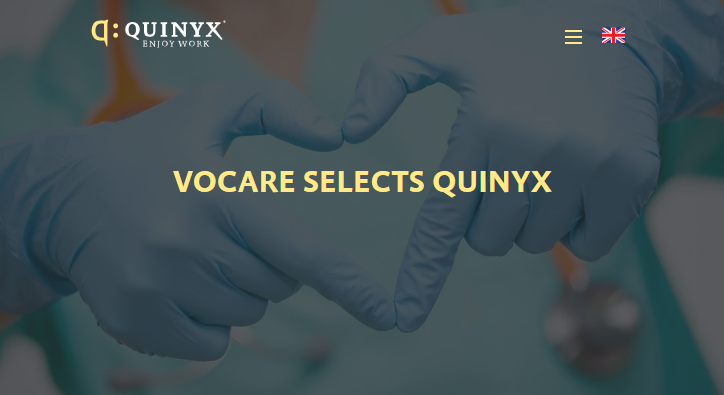 Vocare, a leading national specialist provider of urgent care services has chosen Quinyx as its urgent care workforce management solution. With services spanning from the South West to the North East of England, Vocare provides clinical healthcare services to a population of over nine million patients, and employs more than 2,400 staff. Vocare has been searching for a workforce management solution to help it optimise its Urgent Care and NHS 111 workforce scheduling. "We have been searching for a workforce management solution for more than a year and in Quinyx we've found the perfect Cloud solution," said John Harrison, Chief Executive of Vocare. "The software caters specifically to our needs as an urgent care provider and allows us to meet the ever evolving requirements of our NHS 111 contact centres." "Scheduling for our services is difficult to optimise. Quinyx will support our aim of improving performance as well as enabling us to provide a cost-efficient service." "With Quinyx, Vocare will have unprecedented control over the way they run their workforce and optimise their business", said Quinyx Founder and CEO, Erik Fjellborg. It was Quinyx's healthcare focus, comprehensive offering and our understanding of the unique needs of the Urgent Care sector which secured the deal ahead of other vendors and traditional on-premise solutions. "We're delighted to announce this agreement with Vocare and are excited to be bringing them a modern, cloud-based solution to help them continue to provide innovative, high-quality healthcare services throughout the UK," Erik Fjellborg said. "They've chosen to work with us because they perceive Quinyx to be the best workforce management solution fit for Urgent Care on the market. They want a solution that is both compatible with their NHS 111 Contact Centre operations, as well as their clinical and front-line staff. We're looking forward to a long, prosperous and successful relationship with the Vocare team." Quinyx is the leading provider of cloud-based workforce management solutions. With a mobile-first approach, Quinyx helps to reduce workforce-related costs by automating labour intensive processes like scheduling, payroll, time punching, communication and forecasting. All while creating a smiling workforce. With its headquarters in Newcastle upon Tyne, the Vocare Group is one of the leading national specialist providers of urgent care services. It works in close collaboration with the NHS and other local healthcare providers in local areas to deliver integrated urgent care, GP out-of-hours and NHS 111 services to over nine million patients across the UK.